Whisky in supermarkets is an alien concept in the Netherlands, but that is slowly starting to change. And there’s one question playing on the minds of many Dutch whisky drinkers: is this a positive development? Thijs Klaverstijn reports. If you’re fond of drinking Scotch whisky, you might want to consider moving to the Netherlands. The situation as it stands right now is as good as it gets. The choice of whisky on offer is overwhelming, both in terms of distillery bottlings and those from independent bottlers. And prices are good too (at least compared to most other countries). That’s good for us Dutch folk, but also for those abroad. As a result of the relatively friendly tax climate, Dutch online shops can count on many international orders. Interestingly enough, these orders even come from the UK, where whisky is often more expensive than it is over here. 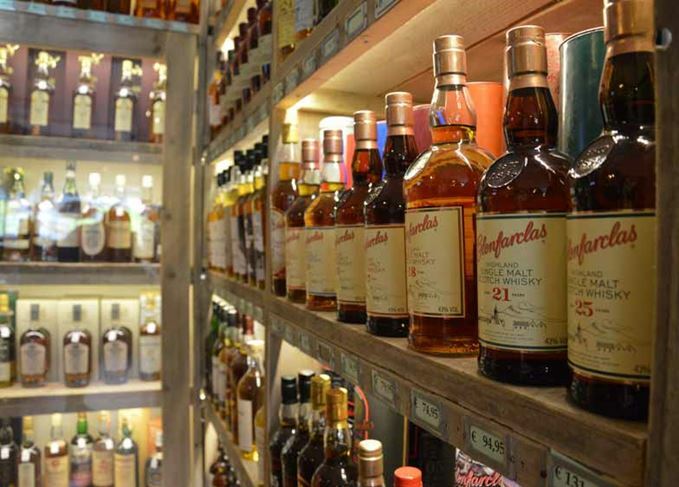 However, the way whisky is being sold in the Netherlands differs from most other countries, where consumers are used to buying their spirits in supermarkets. Buying beer in Dutch supermarkets? Sure. Wine? Why not? But as soon as a drink surpasses 15% abv, legally it is not allowed to be on supermarket shelves. Regulations in the Netherlands are fairly strict and date back to 1881, when the first liquor laws were put into place. Though not as extreme as the government monopoly in some Scandinavian countries, whisky (and other spirit drinks) can only be sold in specialist liquor stores. There are now close to 2,600 of these stores – an amazing number for a country as small as the Netherlands. A big chunk of them are part of national chains and about a quarter are still independently-run. The annual revenue of all of these stores is close to €750m, so it makes sense that supermarkets want their cut. Luckily for them, they’ve been allowed their own ‘borrelshops’ (‘borrel’ being the Dutch word for an alcoholic beverage) after a change to the law earlier this millennium. A borrelshop is a shop-in-shop construction with its own supervisor, who has to be present at all times. In reality, these borrelshops are frequently unmanned and customers have to ring for service, after which they are often helped by one of the (teenage) supermarket employees instead of the supervisor. Unsurprisingly, specialist liquor shops see this as unfair competition because they are obliged to employ specially trained staff over 21 years old. Since 2013, Slijters Unie – an interest group for Dutch specialist shops – has sent out more than 500 requests to enforce the liquor law to local authorities. And even though they won an important legal case regarding sales in supermarkets a couple of weeks ago, it seems like only a matter of time before spirit sales in supermarkets are a reality. Supermarkets and borrelshops (of which there are more than 1,000) are already responsible for 22% of the total revenue of all spirit sales in the Netherlands. And there’s a push to further deregulate alcohol sales. It’s a threat to specialist shops, and it might pose a threat to the wealth of choice that discerning whisky drinkers, whether living in the Netherlands or buying online, now enjoy. ‘There’s a shift among whisky drinkers to rarities and single casks. Meanwhile, the big brands are having their difficulties, so they’d love to be able to sell in supermarkets,’ says Jan Beek, sales manager at Dutch importer Van Wees. It’s something that concerns Jock Shaw as brand ambassador at importer Bresser & Timmer. Growing up in Scotland, Shaw rarely saw any whisky being sold in supermarkets – a stark contrast to the current situation in his birth country. He hopes to avoid a similar development in the Netherlands. Right now, specialist shops in the Netherlands are still in a privileged position, which means whisky enthusiasts are also privileged. Laws protect them from big, bad conglomerates. They don’t yet have to worry about their favourite shop closing because of overwhelming competition from large supermarkets, which happened to many greengrocers and butchers in the past. But when supermarkets do get the right to sell spirits without having to meet any extra requirements, it’s up to consumers to not forget about liquor shops, and vice versa. That’s the only way the Scotch whisky landscape in the Netherlands will remain as diverse and rich as it is today. Not all whiskies are bottled by the distilleries; there’s many a gem among the indie bottlers. Can indie whisky bottlers thrive in Canada? The trials and tribulations of navigating Canada’s complex and highly regulated whisky market. The top places to enjoy a dram in the sprawling landscape of the country’s many bars. Canada’s liquor laws are so absurd it’s time there was an overhaul, writes Davin de Kergommeaux.